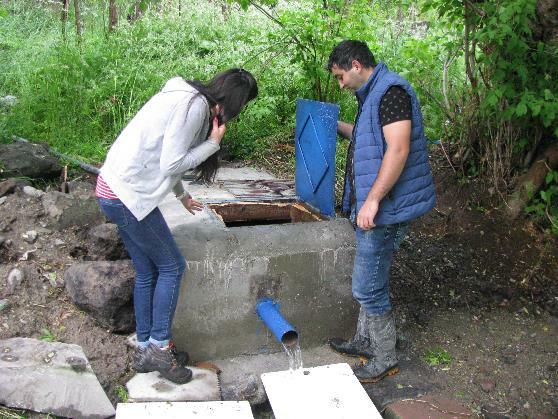 As part of the programme of measures a pilot project for refurbishment of groundwater monitoring network in Akhuryan river basin, Armenia has been implemented in 2016. 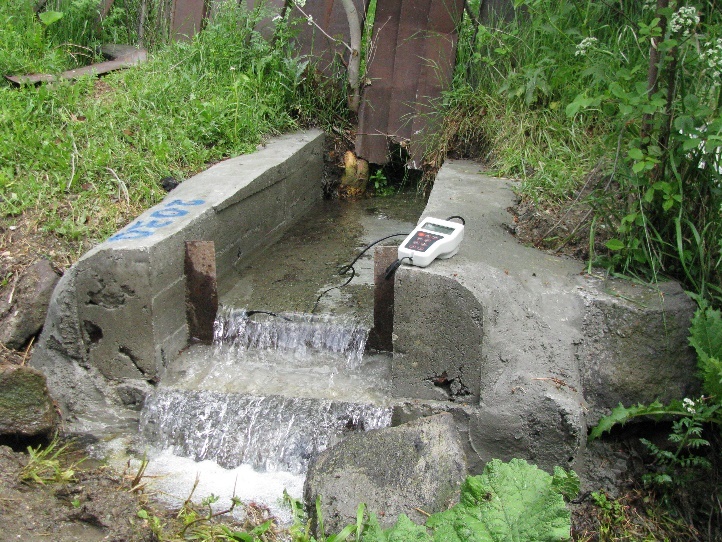 Ten new monitoring stations on natural springs, outflowing from the main production aquifers near Gyumri and Ashotsq settlements, have been installed by the Hydrogeological Monitoring Centre, see figure 1. 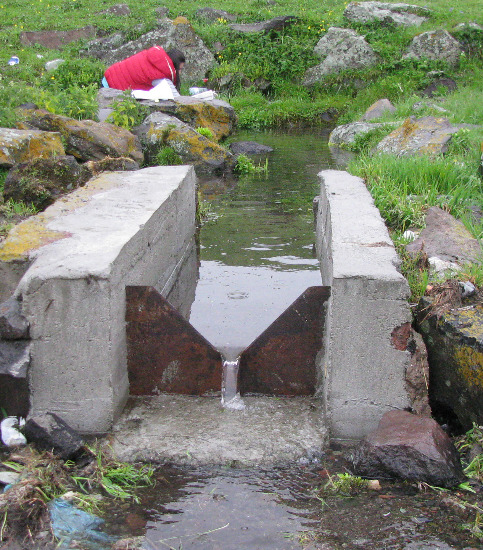 Special installations (triangular or rectangular weirs and water capture devises) were constructed for measuring spring discharge (capacity). 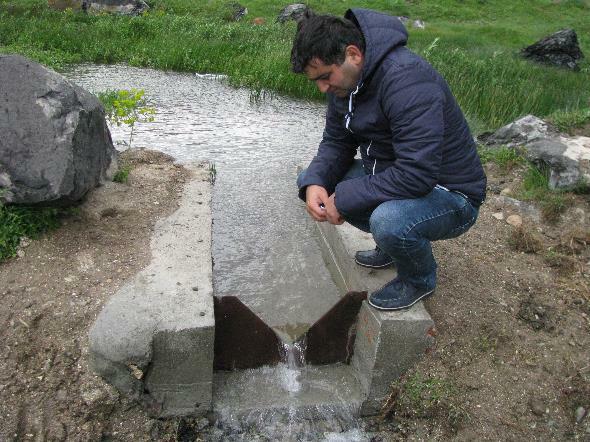 These installations will serve as long-term groundwater monitoring points, thus extending existing groundwater monitoring network in the Akhuryan river basin. Groundwater field survey was organised by the EPIRB project on 23-26 May 2016 with the main aim of checking monitoring installations and collecting groundwater samples from the new monitoring points. 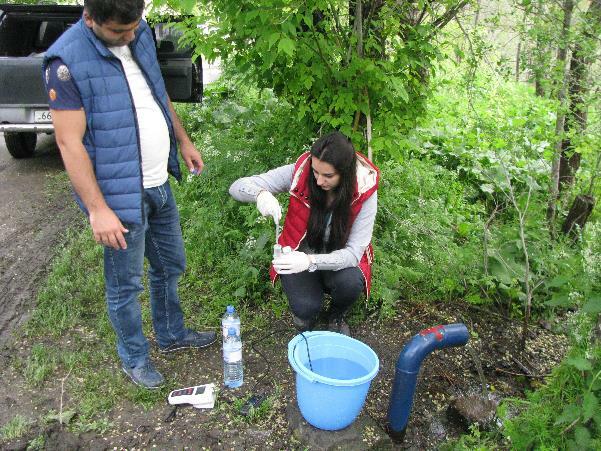 Two groundwater experts from the Hydrogeological Monitoring Centre: Ms. Armine Hakobyan and Mr. Harutyun Yeremyan together with the EPIRB project Key Expert on groundwater Bernardas Paukstys participated in the survey. Coordinates of monitoring points were fixed by GPS, some groundwater quality parameters ((temperature, electric conductivity (EC) and total dissolved solids (TDS)) as well as water level and spring discharge (Q) were measured in the field. Groundwater samples were collected and will be analysed in the laboratory for main cations and anions and trace elements. Table with field parameters and some photos from the survey are presented below (photos by Bernardas Paukstys).